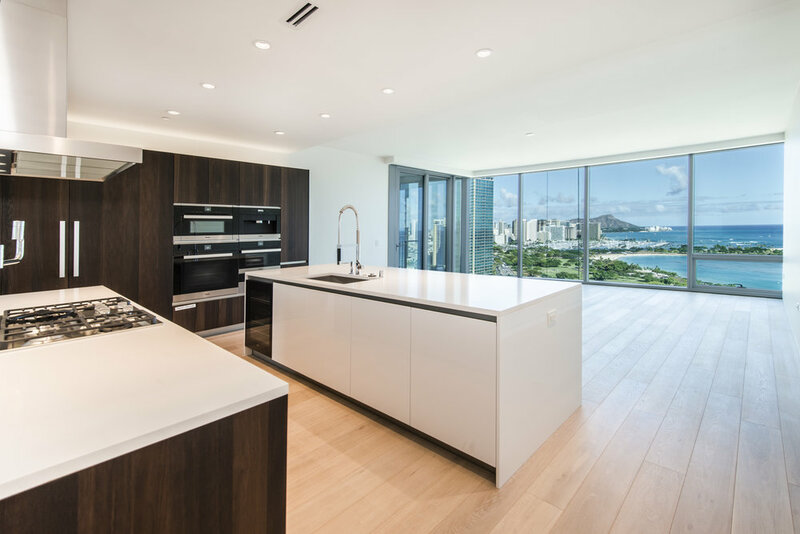 Waiea at 1118 Ala Moana offers the highest standards for luxury living that have never been available before in Honolulu! The 36-floor tower features 174 luxurious residences, desirable amenities, and the best views of the ocean, mountains, and city. The world-famous Nobu Japanese Restaurant will occupy 8,000 square feet of the ground floor of the tower. Ala Moana Beach Park is located right across the street, offering you access to swimming, surfing, paddling, and more at the beach, as well as paths for running and biking! Ward Village offers its residents a dynamic array of retail, dining, and entertainment venues Hawaii’s largest theater complex, and Honolulu's flagship Whole Foods Market, as well as a revitalized Kewalo Harbor. Experience a new level of luxury in prestigious Waiea, Ward Village’s flagship project. Unit 2306 is a RARE 3-bedroom, 2.5-bath residence with a private glass foyer and breezy corner lanai. The 10-foot ceiling easily invites in fabulous views of Diamond Head and Ala Moana Beach Park. The beautifully appointed kitchen with Miele kitchen appliances makes entertaining on any scale a breeze!